Bullying among children today is a prevalent issue that can lead to tragic results. No parent wants to learn his or her child is involved in this type of behavior, but sadly, in the most heartbreaking cases of bullying, many parents never realized the extent of the problem. Discover effective intervention and prevention strategies. Parents will also learn to identify their parenting style and their children's response style so they can communicate better. This timely book will be an invaluable resource for parents who want to intervene, advocate, and protect their children from the harmful effects of bullying. Dr. Kimberly L. Mason is a licensed professional counselor who has worked with youths and their families, schools, police officers, and the surrounding community on issues of bullying prevention. 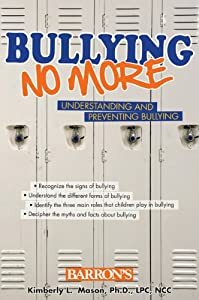 This is a great book that examines bullying in a comprehensive and complete way that I have not seen in other books. I loved the fact that it gives parents tools and resources to be able to engage their children on many fronts to talk about bullying and to help children with dealing with bullying. This book really targets the behaviors that surround bullying which definitely work well to assist any parent with any aspect of bullying. This is a very complete book that is a great resource for all! Book Review - Sometimes I'm a Monster!